Anne Bradstreet was born in 1612 to a nonconformist former soldier of Queen Elizabeth, Thomas Dudley, who managed the affairs of the Earl of Lincoln. In 1630 he sailed with his family for America with the Massachusetts Bay Company. Also sailing was his associate and son-in-law, Simon Bradstreet. At 25, he had married Anne Dudley, 16, his childhood sweetheart. 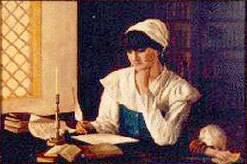 Anne had been well tutored in literature and history in Greek, Latin, French, Hebrew, as well as English. The voyage on the "Arbella" with John Winthrop took three months and was quite difficult, with several people dying from the experience. Life was rough and cold, quite a change from the beautiful estate with its well-stocked library where Anne spent many hours. As Anne tells her children in her memoirs, "I found a new world and new manners at which my heart rose [up in protest.]"a. However, she did decide to join the church at Boston. As White writes, "instead of looking outward and writing her observations on this unfamiliar scene with its rough and fearsome aspects, she let her homesick imagination turn inward, marshalled the images from her store of learning and dressed them in careful homespun garments." Historically, Anne's identity is primarily linked to her prominent father and husband, both governors of Massachusetts who left portraits and numerous records. Though she appreciated their love and protection, "any woman who sought to use her wit, charm, or intelligence in the community at large found herself ridiculed, banished, or executed by the Colony's powerful group of male leaders. "Her domain was to be domestic, separated from the linked affairs of church and state, even "deriving her ideas of God from the contemplations of her husband's excellencies," according to one document. This situation was surely made painfully clear to her in the fate of her friend Anne Hutchinson, also intelligent, educated, of a prosperous family and deeply religious. The mother of 14 children and a dynamic speaker, Hutchinson held prayer meetings where women debated religious and ethical ideas. Her belief that the Holy Spirit dwells within a justified person and so is not based on the good works necessary for admission to the church was considered heretical; she was labelled a Jezebel and banished, eventually slain in an Indian attack in New York. No wonder Bradstreet was not anxious to publish her poetry and especially kept her more personal works private. There is little evidence about Anne's life in Massachusetts beyond that given in her poetry--no portrait, no grave marker or Bradstreet house. She and her family moved several times, always to more remote frontier areas where Simon could accumulate more property and political power. They would have been quite vulnerable to Indian attack there; families of powerful Puritans were often singled out for kidnapping and ransom. Her poems tell us that she loved her husband deeply and missed him greatly when he left frequently on colony business to England and other settlements (he was a competent administrator and eventually governor). However, her feelings about him, as well as about her Puritan faith and her position as a woman in the Puritan community, seem complex and perhaps mixed. They had 8 children within about 10 years, all of whom survived childhood. She was frequently ill and anticipated dying, especially in childbirth, but she lived to be 60 years old. Anne seems to have written poetry primarily for herself, her family, and her friends, many of whom were very well educated. Her early, more imitative poetry, taken to England by her brother-in-law (possibly without her permission), appeared as The Tenth Muse Lately Sprung Up in America in 1650 when she was 38 and sold well in England. Her later works, not published in her lifetime although shared with friends and family, were more private and personal - and far more original - than those published in The Tenth Muse. Her love poetry, of course, falls in this group which in style and subject matter was unique for her time, strikingly different from the poetry written by male contemporaries, even those in Massachusetts such as Edward Taylor and Michael Wigglesworth. One must remember that she was a Puritan, although she often doubted, questioning the power of the male hierarchy, even questioning God (or the harsh Puritan concept of a judgmental God). Her love of nature and the physical world, as well as the spiritual, often caused creative conflict in her poetry. Though she finds great hope in the future promises of religion, she also finds great pleasures in the realities of the present, especially of her family, her home and nature (though she realized that perhaps she should not, according to the Puritan perspective).